Couple of Half’s and a real Ooser! 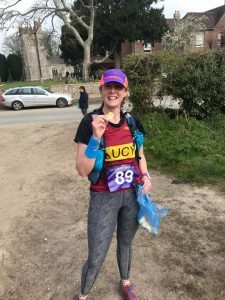 With the approach of some of the big road marathons in the next few weeks, there were still plenty of other races where Okehampton Running Club members were out competing. 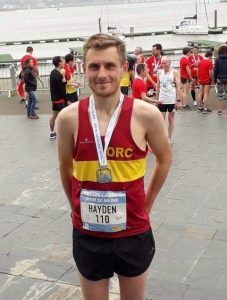 For Hayden Bond it was the fast, flat course of the Cardiff 10k, this year incorporating the Welsh 10k Championships. The route takes in all of Cardiff Bay’s most iconic landmarks, starting and finishing in Roald Dahl Plass and passing the Wales Millennium Centre, Mermaid Quay, the Pierhead Building and the Cardiff Bay Barrage. Hayden produced a superb, well paced run here, finishing in 38.16, knocking two minutes off his current PB. At the Yeovil Half Marathon there was also just one Okehampton runner taking part. With a start and finish in the town centre, the route then heads along the entire length of Yeovil Country Park. It then leaves the town on the western side to Montacute House, before returning on quiet country roads to the Town Centre finish in the Quedam Shopping Centre. Liam Keen ran the Weymouth Half Marathon two weeks ago and finished here in a very similar time of 2.17.49. The strangely named Dorset Ooser, named after an evil-looking wooden mask of local folklore, was the race choice for three ORCs. 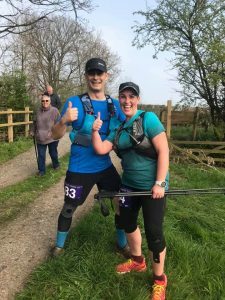 Lucy Marrison, Phil Turner and Ali Holiday took part in this off road marathon, organised by Badger Trail Events where they were promised plenty of hills, a fair bit of mud two fords to cross and some stiles to climb over. Starting in the small hamlet of Turners Puddle, the route immediately goes uphill to follow farm tracks, fields, trails through ancient woodlands and open heathland. With the recent dry weather the mud was in very short supply but the race lived up to its other promises. Lucy was the first of the trio home, having a really great run to finish in an excellent 5.05.02. 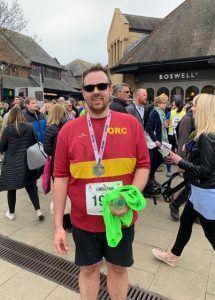 Phil was running his first marathon of any sort and ran with Ali, enjoying the race despite finding it tough in the last few miles, to finish together in 6.25.15 which was under their target time. Error: Error validating access token: Session has expired on Saturday, 20-Apr-19 03:20:42 PDT. The current time is Monday, 22-Apr-19 11:37:03 PDT.